Our monthly full moon meditation begins at 5:30 p.m. with the Evening Chanting, which is a form of meditation, where everyone can participate or listen. Then we have a brief instruction on silent sitting followed by sitting for 15 minutes. Then we have a brief instruction on walking meditation followed by walking meditation for 15 minutes. A Dhamma talk by Ajahn Sarayut. The talk is designed to widen our understanding of meditation and the benefits of it. The evening continues outside with a candlelight procession where we honor the Buddha. The evening concludes about 8:00 p.m. You don't have to be Buddhist to enjoy this evening. Free and all are welcome. 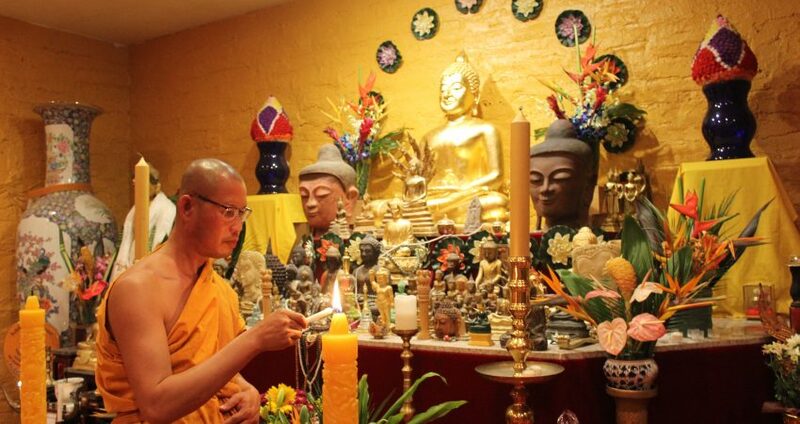 We may also have The Taking Refuge ceremony (5:00 p.m.-5:30 p.m.) for a lay person who wishes to become a lay disciple of the Buddha and has discussed this with Ajahn Sarayut.